Stability refers to the ability of an object to return to its original position after it has been tilted slightly. If the object ﻿returns to its original position without toppling﻿ after being displaced slightly, it is said to be in stable equilibrium. Position of CG Not applicable CG is raised. Relationship between line of action of weight and base of block the line of action of weight W lies within the base area of block. the line of action of weight W still lies within the base area of block. Moment about pivot No moment Anticlockwise moment produced by weight about pivot causes the block to return to its original position. If it continues to ﻿move away from its original position﻿ after being displaced, it is said to be in unstable equilibrium. Position of CG Not applicable CG is lowered. Relationship between line of action of weight and base of block the line of action of weight W lies within the base area of the block. 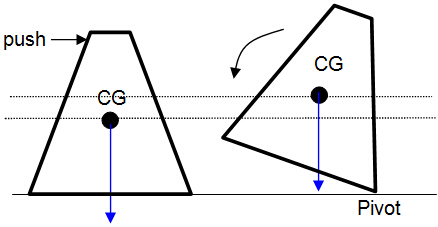 the line of action of weight W lies outside the base area of the block. Moment about pivot No moment Clockwise moment produced by weight about pivot causes the block to topple. If it ﻿stays in its new position﻿ after being displaced, it is said to be in neutral equilibrium. 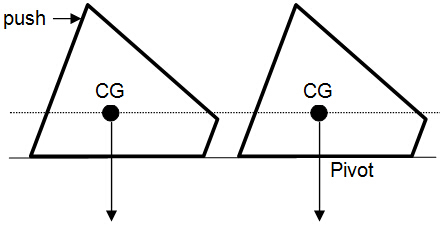 Position of CG CG remains at the same level. Neither rise nor fall. Moment about point of contact No moment is provided by the weight about the point of contact to turn the block.